These AC Nelsen-exclusive Patriot Edition travel trailers, ice houses, and toy haulers will have you quickly enjoying your time with family and friends. Each unit has been built and engineered with a quality that you have come to know and trust with any Forest River product. Not only are they a very affordable way to accommodate your family's camping needs, but you will be able to do so in complete comfort and style. There are a variety of models to choose from with several slide out options. 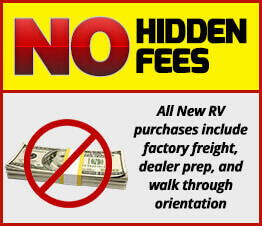 You will enjoy many choices of bunk models and toy haulers for those who can't leave home without a few off-road toys! Each model supplies you with all of the amenities needed to easily cook and prepare food, enjoy a great night's rest, plus bathroom conveniences that make it enjoyable to stay a little longer if you choose. Come choose your new Forest River Patriot Edition travel trailer, ice house, or toy hauler and bring a few comforts of home to wherever you go! Was very happy with the service. Even though I live in Bakersfield, CA, I would not hesitate to recommend you to anyone I know. Helped me with a problem when I was traveling through. - Z.